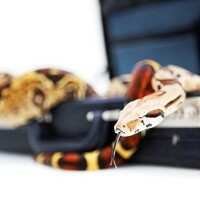 A poll has revealed that a snake was one of the more surprising items that hotel guests have left behind. A poll by lastminute.com has revealed the surprising things that guests leave behind in hotels, which have included snails left in Budapest, a dog in a Milan hotel and a snake found by a Washington hotel guest. Absent-minded travellers also included a businessman in Prague who forgot his wife and went to catch a plane without her, as well as a Dublin hotel guest who left his mother behind. Other surprising items found by hotel staff included 10,000 dollars in bank notes in Washington, a bride's dress in New York and a police officer's identification and handgun in Las Vegas. The poll found that over 20% of hoteliers have experienced a rise in forgotten electronic devises and more than 10% reported an increase in the number of drugs left behind. Hotel guests are often warned that travel insurance for personal belongings only applies if travellers take reasonable care of their possessions. Kathy Dover, head PR executive for lastminute.com UK and Ireland, said: "It comes as no surprise that hotel guests sometimes forget to pack all of their belongings; however we were incredibly surprised by some of the items - and in some cases people - left behind."